John Alsop who is able to say that this is one of the Pouteau cards, and appears in Hoole's Illustrated History of NER Locos as 'Leeds'. The box in the background features in a number of views of LNW locos and I have always understood it to be at Ordsall Lane, one at least showing Bridgwater Trustees Coal Wharf back right. If it is indeed Ordall Lane what took the NE loco there? This is definitely at Ordsall Lane shed, about 1890. There's a well-researched article about this shed by John Hooper in British Railway Journal no. 20 (Winter 1988) pp25-33, which includes a photo of another NER engine there - G1 class 2-4-0 No 676. 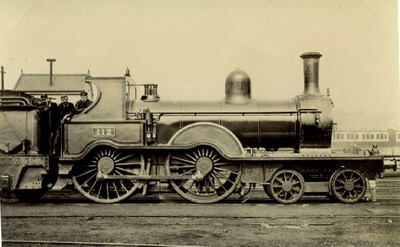 The caption explains that between January 1888 and the mid-1890s there was a weekly (Thursdays only) express from Yorkshire for buyers attending the Cotton Exchange in Manchester; the NER engine was provided by Hull Botanic Gardens shed and was serviced at Ordsall Lane before returning home.